After spending a semester in Israel in high school and absolutely falling in love with the country, I was known amongst my friends as Goldie Davoudgoleh: The Friend That Could Make Aliyah Tomorrow. 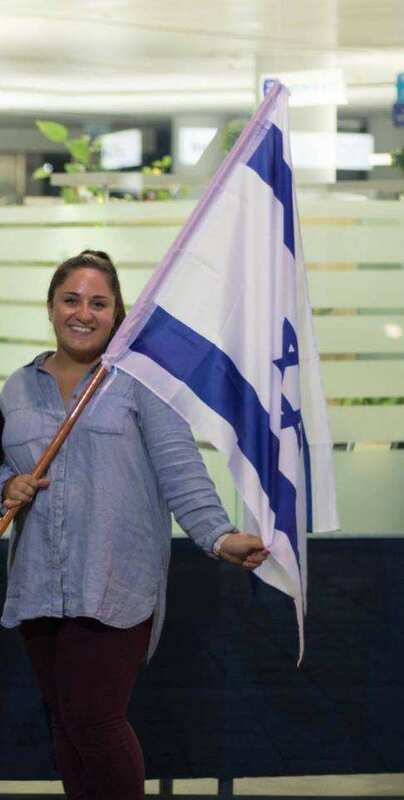 When it came time to figure out my plans for after high school, I wasn’t sure if Aliyah was my next step, but I knew that I wanted Israel to be a part of my future. I chose to start college in the spring semester and spend the fall semester on Aardvark to see Israel in a way that I had never experienced it before. So in August, I packed my bags and left Boston for a semester of interning, learning, and exploring. I’m currently living in Florentine, Tel Aviv, minutes from Shuk HaCarmel, Rothschild Street, the beach, and so much more. On my gap semester, not only did I want to be in Israel, but I wanted to gain experience in a field that I may be interested in. Throughout high school, I was always involved in the music scene, so for my Aardvark internship I decided to intern at Joy Records, a music label that produces and releases EDM and pop music that was started by a former Aardvark student. In my nearly three months at the company, I’ve had the opportunity to work on new releases, meet some of the artists, and learn how the music business works. When I’m not at the Joy Records office, I’m also taking classes at the Aardvark offices. My favorite class is definitely Hebrew Ulpan where I work on expanding my vocabulary and strengthening my speaking skills through real-life discussions and activities. I find myself using these improving Hebrew skills every day, but especially on Tuesdays when we go on our weekly tiyulim (trips) around Israel. From Haifa to the Negev, from the Tel Aviv LGBT Community Center to Dialogue in the Dark, we have traveled to so many different places around Israel so far. Once a month, we also go on overnight trips with the Aardvark Jerusalem group. Traveling with them has not only allowed me to grow close to them, but it has also given me a place to stay when I visit Jerusalem. Aardvark allows its students a lot of freedom to explore the country however they want. On weekends, I take advantage of this opportunity to either go visit friends and family around Israel or spend time exploring Tel Aviv and getting to know the community in which I’m living. My goal for this four-month period was to experience something different than what normal post-high school students experience when they continue straight to college. No doubt have I been working towards this goal for the past three months, but I will continue to spend my last weeks here with that mentality. Israel has always been a place that brought me happiness and comfort, so I’m so glad that I’ve been able to take in another dose of the beautiful country – an experience that most are not getting before heading to college. For the rest of my time on Aardvark, I’m looking forward to continuing to take in as much of Israel as I can through our tiyulim, my internship, our classes, the people I’m meeting, and the culture I’m experiencing. While I’ve had many unforgettable experiences on Aardvark so far, like cooking meals with my friends and jamming out to throwback playlists with my roommates, one experience that was particularly memorable to me actually happened during the first week. Our first weekend in Israel we spent Shabbat together as a group, going to Kabbat Shabbat services, having Shabbat dinner together, and spending time doing yoga and acro-balance on the beach. After our beach activities, it was time to end Shabbat with Havdallah. I was chosen to lead the group in Havdallah as I was one of the only people who knows the prayers and their order. As we lit the braided candle, I stood in the middle of a group of people I didn’t really know yet and led them in the Jewish weekly ritual known to some and not others. While it was a piritually eye-opening moment, I now realize what an amazing group of people, now my closest friends, I had the privilege leading in Havdallah at sunset on the beaches of Tel Aviv. I will always remember that as one of our first moments of togetherness as a group and as a moment of pure beauty.